The Phuket Blue Sea is a cocktail available from Imm Thai Fusion. The restaurant also does non-alcoholic versions of their cocktails, which is the one I ordered for at £4.95. 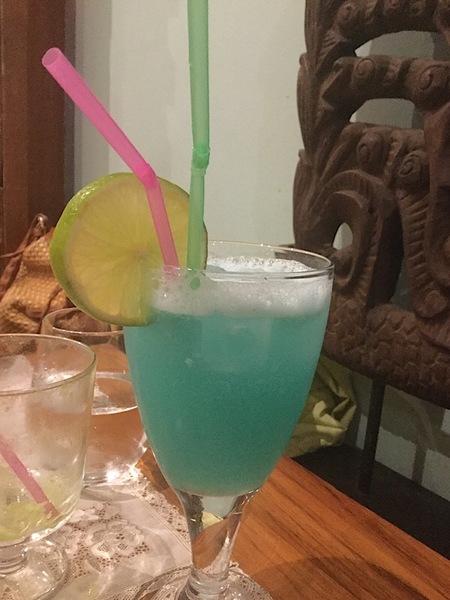 The main ingredients are lime and lychees, but they needed to add just a tiny dash of Curaçao to give the cocktail its distinctive blue colour. Despite the colour, Curaçao is actually made from the peel of bitter oranges on an island of the same name. It has an orange flavour, which was mildly detectable as citrus here. The (almost) mocktail was sweet, but had a hint of sharpness to it, and although there was a tiny dash of alcohol, I wouldn't have know unless I was told. Also known as the Blue Lagoon, this drink is both attractive and delicious, and just the treat for a night out.